The Nokia 810 has an identical camera to the Nokia 820. It's an 8MP unit with a 26mm wide-angle lens with f/2.2 aperture and a dual-LED flash. It has the same multi-format sensor, which allows it to lose only a marginal amount of resolution when switching to 16:9 aspect ratio - the aspect of the phone's screen and that of most modern HDTVs. It snaps photos at 3264 x 2448 resolution in 4:3 mode and 3552 x 2000 in 16:9 mode, only 11% less resolution. Most other cameras simply crop a 4:3 photo into a 16:9 photo and lose a quarter of the resolution. Unfortunately, the Lumia 810 camera suffers from the same issues as that of the 820. The extra wide angle lens has a noticeable sharpness loss in the left and right border area. The effect is a bit more pronounced on the right side in our test samples and is noticeable even without pixel-peeping. Still it's hardly a big issue and the compromise is worth the benefit of the extra wide angle of view. The other issue the camera has is that even at base ISO 100, the photos have a considerable amount of noise even in daylight. The good thing is that it's only luminance noise, and not the visually more unpleasant "chroma" noise (the dreaded color blotches). Overall, the photo quality is above average - the photos have slightly inaccurate colors, but they are nice to look at, with decent amount of resolution. The extra resolution in 16:9 mode, the relatively bright aperture and the extra wide angle are all strong hands when compared to the competition. The shutter key will wake the phone up with a single press and launch the camera app. The Lumia 810 is not the fastest shooter around and it takes it a couple of seconds before a photo is taken. This is more delay than we're used to from modern phones. Cinemagraph create photos that are mostly static, but a part of them is animated, it really brings them to life. You have to hold the phone steady while shooting. When you're done, the Lens will offer two (sometimes three) areas that can be animated and when you pick an area, you can tweak the animation, trim it, and set the loop pattern. 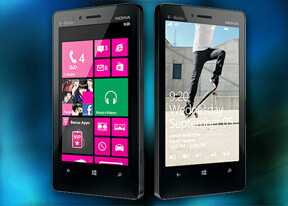 You can check out some samples we shot with both lenses in our Nokia Lumia 820 review. Here are several real-world camera samples taken with the Nokia Lumia 810 so you can judge the photo quality by yourselves. The Nokia Lumia 810 shoots 1080p and 720p videos (720p is the default mode). The quality of the videos is surprisingly good in terms of fine detail after what we saw with the still camera. Colors are still a bit off but the bigger problem is that the continuous autofocus is a bit too sensitive (at least it's quick and mostly unobtrusive). The bitrate of the 1080p video was a steady 21 Mbps while the framerate hovered around the 30 fps mark. Audio is recorded in mono (99Kbps, 44.1kHz), which is rather disappointing, given that the smartphone has two microphones. With 720p videos the bitrate fell to around 16 Mbps with the same 30 fps framerate. Audio is mono again too. You can also download an untouched 1080p@30fps video sample.